Want to train 5 or more people in solving problems? Click here. Bruce Honig is the founder of Honig Idea Guides. Bruce brings over 27 years in the field of Education, Training, Facilitation and Organizational Development to his clients. Bruce is an expert in solving problems. Bruce has a B.A. in Educational Philosophy and a M.A. in Educational Psychology and Curriculum Design. Bruce's unique understanding of the creative process led him to invent a nationally marketed board game, CREATE™: The Game that Challenges and Expands your Creativity, as well as many other games such as Just Imagine™, Sproin-n-g™ and Choices™. He also produced, wrote and directed Brainstormers™ a for television game show. He edited and wrote The CreativeMind, a newsletter devoted to supporting innovation in business, and wrote many journal articles on the creative act. He is also the principal author of Creative Collaboration: Simple Tools for Inspired Team Work published by Crisp Publications Bruce was a board member of American Society for Training And Development and a member of the International Association of Facilitators. Treat this book like most any recipe book when creating a meal. In using a recipe book you pick and choose whichever recipes would suit your needs. Much in the same way, pick and choose the “recipes” in this book that are appropriate for the problem. These recipes are for "rational" problems (a problem as a result of a change) as well as for creative problems (a new situation or opportunity). All of these “recipes” can be used in a group and an individual can use most. Idea Generating: Tools for generating ideas. Decision Making : Tools for determine which idea is the best idea. 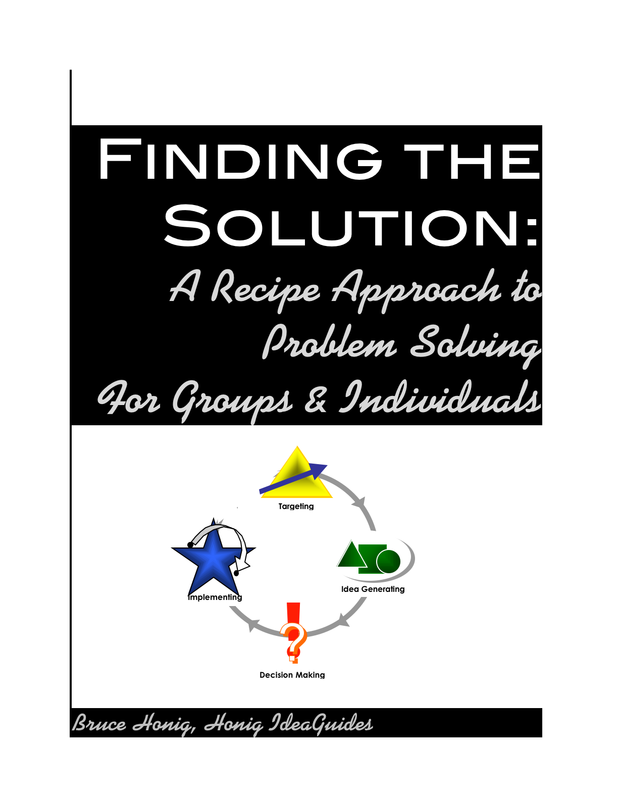 Implementing: Tools for help you and your team to implement the solution. $13.53 to download. Have it now!